Alondra Nelson has done an exemplary job of breaking down incredibly complex social and scientific topics into language a layman can understand without oversimplifying. While it was a bit dry at times, The Social Life of DNA was replete with information. It was so dense with knowledge that it took me thrice the normal time to read.Not only do I feel that I have learned something about genetics and genealogy, I have, more importantly, come to a greater understand of the cultural significance of these studies in the black community. I have long understood the theft of culture and family from Africans and African-Americans as a part of the many horrors of slavery. What I had failed to understand was how emotionally significant an ethnic identity can be to a person. In particular a person for whom this identity has not only been taken but replaced with an identity as victim.This has given me a great deal to process for which I thank the author.I received a complimentary copy of this book via a Goodreads giveaway. Many thanks to all involved in providing me with this opportunity. We think of DNA as clear-cut scientific evidence, but this book shows how in many cases the data are incomplete and, in any case, we often see only what we are hoping to find. Even so, DNA analysis can provide a valuable sense of social inclusion. The book is very dryly written and clearly aimed at academicians, but as a lay reader I still gained a deeper understanding of the politics of DNA and of the importance of the social role it plays in reconciliation for African Americans. I will no longer be surprised by the fervor with which ancient burial grounds are disputed or the strength of identification with unseen ancestral homelands, actual or presumed. One of the best books I've read recently. Highly, highly recommend. It was excellent in terms of research, writing, and, most of all, content! I learned quite a bit about the place genealogy holds in Black American/African-American communities. (There's a whole world of history that we never learn in school...) Add to that recent breakthroughs in matrilineal and patrilineal DNA testing after the mapping of the human genome, and you have an exceptional book. I tend to be pretty critical of non-fiction books, but Nelson did an incredible job and took great pains to present this history in a balanced and objective away. Apparently Alondra Nelson works at Columbia. I can only hope I'll have the chance to hear her speak one day! I read this for its loose relevance both to my graduate studies in genetics and my own genetic ancestry results (or 4% thereof). I think it was a beneficial read. I'd previously accepted the limitations of the data you can glean from DTC ancestry tests, and sort of dismissed their value as being loosely interpretable at best. So I think the importance to me of reading this book was pulling my mind out of the technical granularity and considering what social value these tests bring to people who feel disconnected from their personal history. Thank you to the author for reminding a scientist of the human perspective. It also lead me to reflect on the potential value of expanding the databases of DNA samples available from the different African populations, so I hope that does improve. It was a good reminder to be cognizant that such databases need to be truly reflective of the needs of all the potential beneficiaries of the technology--beyond ancestry testing and inclusive of health applications. Oh and one more insight from the book--DNA has this somewhat hallowed status in popular culture, probably thanks to its precision in forensic applications. It's important to keep in mind this perception, given that it's highly misleading to think of all DNA technologies in the same way. This is an accessible and engaging look at DNA in the particular social context of African-American genealogy. Nelson examines how DNA and genetic lineage knowledge--and the act of interpreting said knowledge--assist people in shaping their own identities, senses of self and orientation to the past, and community ties. The book is weakest on the reparations angle of its subtitle, but that's because DNA's usefulness in seeking legal reparations is weak; in general, the American legal system is not equipped to deal with reparations. I wished Nelson did a deeper dive into the commercial aspect (but I'm someone who snarks at those Ancestry DNA TV commercials OMFG "HISPANIC" IS NOT A NATIONALITY), but she did an excellent job with--and brought sufficient skepticism and empathy--to explaining why people are interested in DNA technology as a tool to understand themselves and to explore their identities in the context of the past and in the context of evolving communities.Disclosure: I received a review copy of this book from the publisher. I received a copy of this book from LibraryThing in exchange for an honest review.This is a very interesting topic and Nelson covers it well. Overall, I liked the book. I think the sections on reparations were especially interesting in the brief history given and how DNA has been used in connection with reparations.I like how Nelson combined her own personal experience with the history of DNA and how it has been used in matters regarding race. This added an individualized tone to the text, which helped to balance out the science and history. While I found the information in the book useful, the text was often very dense and the amount of information was overwhelming. It took me almost a month to get through this book, which is significantly longer than it usually takes me to finish a book, especially considering how short the book is. This is not a book one can just speed read through. I liked the book, but some of the chapters are kind of hard to get through because of their density. I want to thank goodreads first reads and the author for allowing me this opportunity in winning a free copy of The Social Life of DNA: Race, Reparations, and Reconciliation After the Genome for an honest review.I found this to be a fascinating book on the dna genetic genealogy of race,politics and identity.the author her unique insight into the genetic science and history of our dna.I find that gives people a more clear and understanding of how our dna transforms us all and how we too can understand our own history.I again would like to express my joy in reading this book and for anyone,like myself,who wants to understand and look into their own DNA this is a book to start that process. "...the double helix works a spyglass that telescopes back in time allowing us to see the healing that remains to be achieved in American society." The Social Life of DNA is a wonderful book that explores the history/significance of DNA testing for African-Americans and at the same introduces a much-needed critique of the ways in which it's been received and put to use. It is at once an academic and personal journey with interesting twists and turns.If I have any complaint, it's that the whole thing was far too condensed. It was evident from every page that Nelson had a LOT more to say (heck she was introducing new terms and dropping footnotes in the last paragraph of the book). So I'd hope one day to read the "Directors Cut", since I'm certain there's lots more fascinating material on the cutting room floor! This book takes a look at genetic genealogy (specifically in tracing African American roots), at it's positive and negative aspects, and at it's capabilities and limitations. Dr. Nelson explores how DNA testing effects the discussion of race in America, and brings the discussion back into the public sphere. She also briefly reviews the history of attempts for African Americans to gain reparations for enslavement of themselves and there ancestors (A fight that has never truly stopped). She looks at it's functions as a means of providing a social connection, personal identity, and inclusion in a group. She examines how it effects the politics of race in the U.S. and around the world. She looks at it's impact on reconciliation of individuals' identities and between "races". It was a very interesting read. 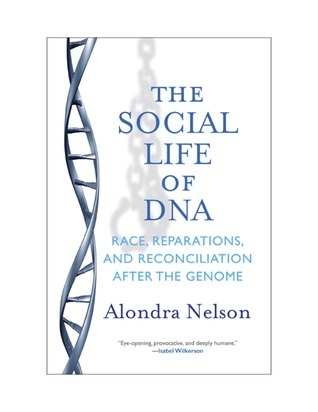 This book brings together racial politics and DNA-based science in a startling and original way: Nelson shows us how DNA is being used by genealogists to discover the roots of African Americans whose ancestors were enslaved.The book includes interviews with "kin-keepers" (family members who research and keep alive family histories); intros to scientist-activists such as Rick A. Kittles; and a trip through the legal minefield of reparations lawsuits. Nelson's grasp of the science and its socio-political uses is admirable and her explanations accessible.This story is far from finished. As the science becomes more advanced, we'll be able to go back further and with more accuracy. Will these developments herald an age of greater justice and acknowledgement of the sins of the past? It's unlikely. Such a reckoning would involve major admissions of guilt on behalf of families, communities, companies, states and the national government. Whatever the outcomes, Nelson's excellent book shows us the truth is out there, and someone in a lab coat may one day help us find it. I sat in on a lecture of Dr. Nelson's in which she pretty much summed up this book, so understand that I skimmed this more than read it. While interesting, the book was much more academic and dry than I personally enjoy. However, Nelson does a great job of making her science relatively easy to understand. Her observations are acute and her subject matter, interesting. She seeks to tackle a great depth of intersecting social and biological sciences, and is generally successful. While this book was interesting, I think there are better investments for readers interested in race and genetics. I also really enjoyed the complexity and beauty of Bob Kosturko's cover design. I liked holding it in my hands and being seen with it. Fabulous book that focusses on the gene in genealogy and deals with histories of African Americans after the introduction of home genetic-testing kits. It is shorter than most other academic monographs and is accessible enough for anyone who isn't familiar with "The Social Life of Things". It combines interviews that show us the aspirations of individuals in tracing their histories to a whole other continent and how family histories told as stories is used to verify the claims made by the DNA test results, to question the veracity attributed to DNA as objective history. Alondra Nelson - Alondra Nelson is professor of sociology at Columbia University, where she has served as the inaugural Dean of Social Science and director of the Institute for Research on Women, Gender, and Sexuality. Before arriving at Columbia, she was on the faculty of Yale University and received the Poorvu Award for interdisciplinary teaching excellence.She is the author or editor of four books, including Body and Soul: The Black Panther Party and the Fight Against Medical Discrimination, for which she was recognized with the Mirra Komarovsky award as well as several other prizes. Her most recent book is The Social Life of DNA: Race, Reparations, and Reconciliation after the Genome. She is also an editor of Genetics and the Unsettled Past The Collision of DNA Race and History; Technicolor: Race Technology and Everyday Life; and "Afrofuturism" (a special issue of Social Text).Her essays, reviews, and commentary have appeared in the New York Times, the Washington Post, Science, and the Boston Globe, among other publications. For more information, please see alondranelson. You can follow Alondra on Twitter.